Edited to add: SFYTT fans get 15% off their orders by using the code “SFYTT15″! Well, it's time for Jen's Sketch For You to Try! This week we are being sponsored by Your Next Stamp, a fun little stamp company with super cute stamps and accessories. This little girl is from the Fhiona line. She's a single (and looking), and called Flower Bouquet Fhiona. So sweet! SUSIE Q-TIP: Instead of ribbon, use twine doubled or tripled or whatever "-led" you want. My new favorite is Divine Twine from The Cat's Pajamas. It's the perfect thickness and it comes in several yummy colors. Um, it's divine. Here's the sketch that we'd love for you to play along in for your chance to win some stampy goodness from Your Next Stamp! Jen's got all the details over on her blog. 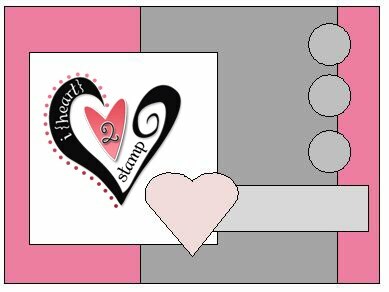 First, be sure and check out what my divine SFYTT sisters did with the sketch and see some more eye candy here and there from Your Next Stamp, too! Eric Update: We had to get up reeeeeeaaaaally early yesterday to be in Dallas at 8:20 in the morning for labwork, a doctor appointment and an all day chemo session of R-CHOP. It went off without a hitch and the doctor said he's doing well other than being slightly anemic. He's been feeling so well lately, that it was a shame he had to go and get "messed up" yesterday! However, Eric was (and still is) extremely delighted to hear that he should only have one more round after this one! So we will go in on Monday for another spinal tap (#5) and then if everything goes as planned, his last R-CHOP should be at the end of the month. All he is hoping for is to be well enough to start writing for the Dallas Morning News again once the high school football games start--he loves that! OH and ya'll know how he's been officially diagnosed with a paralyzed vocal cord--well yesterday, his voice cracked a couple of times and his normal voice peeked through for a couple of syllables at different points during the day! Not sure if it's trying to come back or if it was just a fluke, but it took us both by surprise when it happened! Now he says he's reverted back to being a teenager--180 pounds, always hungry and his voice is cracking! I told him he left out one important male teenager "condition" and I'll leave that right there for ya'll to ponder. 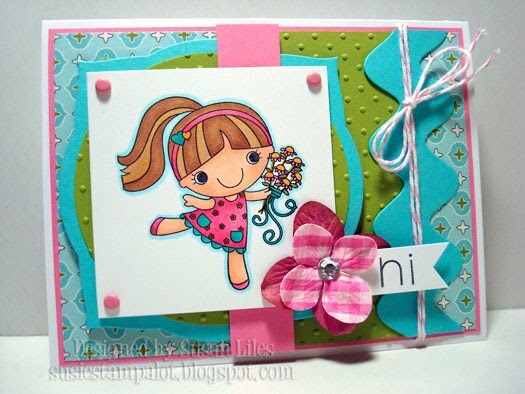 Your Fhiona (aka Audrie) card is so adorable! Lovin the color combo and different colored hair :o) Your girls sound like they have alot of fun together and I'm so happy to hear that Eric got some happy news! Susie, this is SOOOO STINKIN CUTE! I love all the fun colors and that divine twine is a must have now! I love the bright cheerful colors you used and all of the texture you gave to the layers. This is an adorable image! I'm glad to hear that Eric is feeling better and that's good news if he only has one round left after this one. this is so cute! I Love it! Great, bright colors! What a cute story!LOL Thanks for sharing! Super cute card...love your coloring and that image is adorable! This is super cute! Love the fun bright colors! So cute, Susan! You have such a way with the bright colors - love what you did here!! Thanks for the Eric update, too! Glad to hear the chemo is almost over! Uh oh. Is that little teenager issue R rated? X rated? Holy cuteness Susie Q! This is one fabulously cute card! Love the colors and all your fun details! Rock on sistah! I have always loved the Suzie Q tips section of your posts and have enjoyed hearing the stories about your family (the little tidbit about your girls was so delightful)and I'm typically doing so behind the scenes so to speak. But today I wanted you to know that I am thrilled to hear your husband is improving. Your positive attitude is so encouraging. I shall keep you in my prayers and hope that football season is upon us in no time! LMBO!!! You crack me up!! I hope things continue to stay good, and he bounces back from this session quickly!! Super cute card, your kids sound adorable!! OMG But I LOVE YOU!!!! LMAO!!!!! LOOOOOOOOOOVE every bit of this! 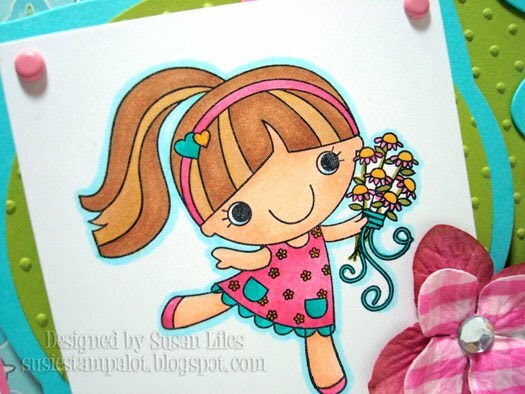 Your coloring is AMAZING and I love all the little touches! Congrats on the wonderful news about Eric, I am so glad for him!